In November 2014, the most popular blog post was "Ebola and the Role of C4D" by Paolo Mefalopulos of UNICEF. In this post, Paolo describes the urgent need to use communication for development (C4D) in the fight against Ebola. While a medical response is clearly necessary, there is also an urgent need to monitor and prevent the spread of the disease. Like many other public issues, monitoring and prevention of Ebola requires informing the public of the scope of the problem as well as the possible solutions. C4D is helpful in this regard because it helps educate people and encourages community members to change social norms, attitudes and behaviours. Paolo asserts, "C4D experts should be given the space and autonomy to address and engage communities with a blend of expert-driven messages as well as knowledge derived from local norms, maintaining a rigorous and effective approach without being pushed by external pressures that value immediate products over long-lasting results through community engagement." Ebola has been defined as the most serious challenge humanity has faced in recent times. The mobilization for addressing this challenge is becoming greater by the day— many colleagues are already fighting this emergency and others are ready to join the fight. The medical response, which at first came under fire, is now being adjusted and improved rapidly. Nevertheless, a medical curative response, as good as it can be, it is not sufficient to win this war. There is the need to monitor, respond quickly, and, most of all, prevent the spread of the disease. A number of actions and expertise need to work together to be effective. One of such key area of expertise is Communication for Development or C4D. C4D- also at times known as Development Communication, Behaviour Change Communication or Communication for Social Change- is probably one of the most critical, yet often neglected ingredient of development. Its adoption and institutionalization has traditionally gone through a number of ups and downs since it first began to be applied in a more scientific manner in the 70s. The reasons for such swings are not always clear since its functions and objectives have been, and still are, consistently acknowledged as crucial to achieving an effective, sustainable and people-based kind of development. You know those pictures of Angelina Jolie hugging a starving child in Chad? Elton John singing at AIDS fundraisers? 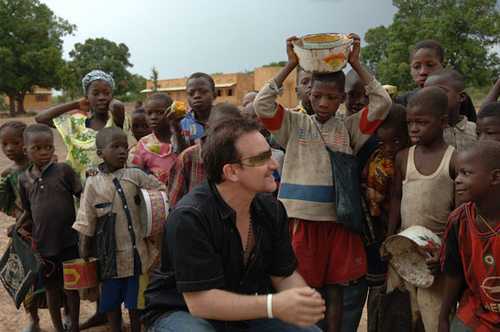 Bono being everywhere all over Africa in campaigns against poverty? There is a very good reason why celebrities lend their names and faces to development causes: it works. By the sheer force of their fame they draw attention to issues that would normally not be on our radar screen and they are able to mobilize parts of the population that does not always have access to information about development issues. So all you need to do is put a famous face on your cause and you’re set for success – increased awareness, increased attention, increased funding, and sometimes even behavior change? It’s not quite as easy as this. Picking the right celebrity is important, or the whole thing can backfire. Here are a few dos and don’ts when involving celebrities in a cause. The third of the ten key issues about development communication is a crucial one and it asserts that there is a significant difference between development communication and other types of communication. What is the difference and why is important? Let us start by defining communication’s most renowned function; i.e. A few months ago, I finalized the Development Communication Sourcebook published by the World Bank. It includes a section entitled “Ten Key Issues on (Development) Communication” that addresses misconceptions frequently encountered when working in this field.